If you've got an electric toothbrush with a plastic bottom, you might have marveled at how it charges up apparently by magic standing on what seems to be a plastic stand! How do two bits of plastic charge up the battery inside your toothbrush when there is no direct metallic contact between them? How on Earth can electricity flow between two plastic insulators? What's happening here is a neat trick called wireless (induction) charging, and it's the power behind everything from rechargeable toothbrushes and phone charging mats to the latest wireless recharging bays for electric cars. We're about to take a closer look at how it works, but if you don't already know the basics of how ordinary electric transformers work, you might like to take a quick look at our article on transformers before you continue. If you'd like to know about other kinds of chargers, you might prefer to look at our article on battery chargers. 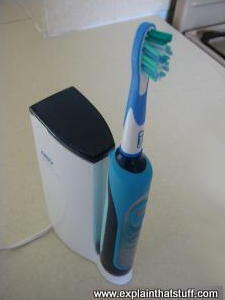 Photo: An electric toothbrush standing on its induction charger. The battery in the brush charges up even though there is no direct electrical contact between the plastic brush and the plastic charger unit in the base. So how does electricity pass through two layers of plastic? Most of the small electronic appliances we use in our homes work on relatively low voltages—typically 5–10 percent as much voltage as hefty electric appliances like vacuum cleaners and clothes washers. That means we generally need to use transformers to "step down" the domestic voltage so it will safely power electronic gadgets without blowing them up. All those chargers you have (little boxes attached to wires that plug into things like your MP3 player and cellphone) actually have electricity transformers hiding inside. Photo: Ordinary electric charging: all the components of the transformer are contained inside the charger. So far so good—but what happens with something like an electric toothbrush, which has no power lead to plug into the wall? When you stand the toothbrush on its charger, how does the electricity flow from its plastic-coated base into the battery inside the brush when plastic is an insulator (that is, doesn't allow electricity to flow through it)? 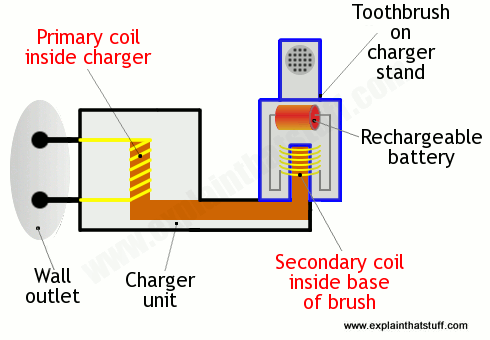 Artwork: Induction charging: half the transformer is in the toothbrush; half is in the stand. The primary coil is in the charger base and it has an iron peg on top of it covered in plastic. The secondary coil is in the base of the toothbrush, which you stand on the iron peg. What's the peg for? It's not just to stop the toothbrush wobbling about: it's the core that links the primary and secondary coils together electromagnetically. When the toothbrush is standing on the peg, you've got a complete transformer that works by electromagnetic induction: energy flows from the coil in the base to the coil in the toothbrush via the iron peg that links them. The two ends of the coil in the toothbrush are simply hooked up to the rechargeable battery inside. Photo: The bottom of an electric toothbrush has a hole in it so it sits securely on the "peg" on the base—actually the core of the transformer. 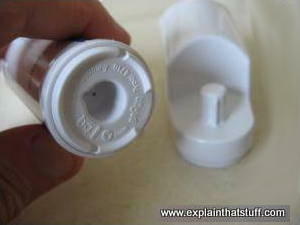 The copper coil (right) is just above the plastic base, running around the hole. 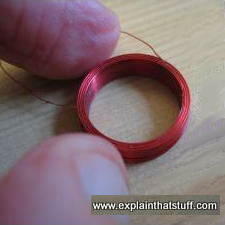 Photo: The copper charging coil from inside an electric toothbrush. 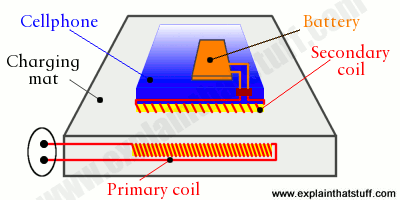 The coil works as the secondary coil of a transformer. It's fitted at the very base of the brush and sits around the little iron peg on the charger stand when the brush is sitting on its base. The two leads from the coil connect to the rechargeable battery inside the toothbrush. A charger that works like this is called an induction charger. Safety is the main reason for using an induction charger in the bathroom: you don't need a power cable or exposed leads coming out of the base of your toothbrush, which typically gets wet. Electric shavers often use induction chargers for the same reason. Wireless mat-type chargers (sold under the trademarked brand name Powermat®) are induction chargers too. The mat works as one part of a transformer (essentially like the stand of an electric toothbrush), while the other part of the transformer is either a circuit embedded inside your device (like the coil inside the base of a toothbrush), a pad that clips onto the back on your device, or, for a cellphone, a replacement battery cover with a built-in charging coil that connects to the charging socket. There's no magic involved: it's just electromagnetic induction again! Artwork: A Powermat uses exactly the same principle as an electric toothbrush charger. If you have a cellphone mat charger, it works like this. One part of the charger (the primary coil) is inside the mat. The other part clips onto the back of your phone, usually as a replacement battery cover. This bit contains the other part of the charger (the secondary coil) and connects to your phone's charger port (or the battery's terminals inside the phone). Although they work efficiently and they're generally more convenient than wired chargers, charging mats still have their drawbacks: you can only charge so many devices at once, for example, and your gadgets have to be sitting right on the mat. WiTricity's rival chargers are slightly different again—and more convenient, inasmuch as they allow charging at a distance of a meter or so (several feet) from the charger. Unlike an ordinary induction charger, a WiTricity charger has a transmitter coil that oscillates at a carefully chosen frequency, sending its power to receiver coils in nearby devices that are tuned so they "resonate" at the same frequency—similar to how radios are tuned, selectively, so they only receive one station from a broadcasting transmitter. That ensures only the "coupled" devices themselves charge up, with minimal effect on other electrical devices nearby. Artwork: In the WiTricity system, a wire-wrapped coil (red and yellow) in the charger (left) produces a magnetic field at a specific frequency. A coil in your cellphone or other appliance (right) is designed to "resonate" at the same frequency. When the two coils are "coupled" in this way, energy is transferred from one to the other, even though they may be some distance apart. Wireless power transmission was originally proposed by Nikola Tesla (1856–1943) toward the end of the 19th century. It's a tribute to Tesla's genius that he anticipated modern systems like Powermat and WiTricity over a century before they were developed. Nikola Tesla, US Patent 645,576, 1897/1900. Although you might expect super-convenient wireless chargers to be everywhere by now, arguments over standards and compatibility have seriously hampered their takeup. Powermats, for example, were promoted by a body called Power Matters Alliance (PMA), but there were also two rivals, Wireless Power Consortium (promoting a technology called Qi) and Alliance for Wireless Power (A4P). All this is confusing for consumers, to say the least. PMA and A4P have since merged into a new body called AirFuel Alliance, but that still leaves two competing systems offering wireless charging: Qi and PMA. You could see this as part of a wider issue of gadgets and appliances using all kinds of different batteries and generally needing their own, proprietary chargers working off different voltages or currents (a problem that USB chargers have been steadily addressing over the last few years). But it's also an inevitable part of how technology develops through a kind of "survival-of-the-fittest" evolution: the best and most useful technologies thrive; lesser "species" fall by the wayside; and companies are keen to push their own versions of technology from which they can (theoretically) make more money. One way or another, wireless charging will settle on a single, common standard—and the January 2018 announcement that Powermat has joined the Wireless Power Consortium suggests that will be Qi. The process has being driven by product makers favoring either one standard or the other. Quite a few car manufacturers, for example, now offer wireless charging mats for mobile devices, but while some (such as Cadillac) have been hedging their bets and supporting both Qi and PMA, others (Toyota and Ford) have firmly picked a side—and settled on Qi. In similar vein, while Samsung phones have supported both Qi and PMA for a while, Apple announced it was going to settle on Qi support alone when it released the iPhone 8 and iPhone X. Electric cars, increasingly charged from wireless power bays in the street, are also picking sides. Mercedes, for example, has picked Qi. So is this modern war of the (wireless) currents well and truly over? Time will tell..
Mystery Brand EV Will Offer WiTricity's Wireless Charging This Year by Philip E. Ross. IEEE Spectrum. April 19, 2018. Electricity cables are a big drawback of plugin hybrid cars, but wireless charging points could soon change all that. Watt? You thought the wireless charging war was over? It ain't even begun by Andrew Orlowski. The Register. January 10, 2018. Wireless charging is converging on the Qi standard. WiTricity Leverages Magnetic Resonance for Flexible Wireless Charging: IEEE Spectrum. May 5, 2017. A review of how WiTricity has extended the range and flexibility of wireless charging using magnetic resonance. Ford to charge electric cars wirelessly by Cara McCoogan. Telegraph. January 3, 2017. Thanks to wireless charging, you won't need a power cord for your new electric Ford. 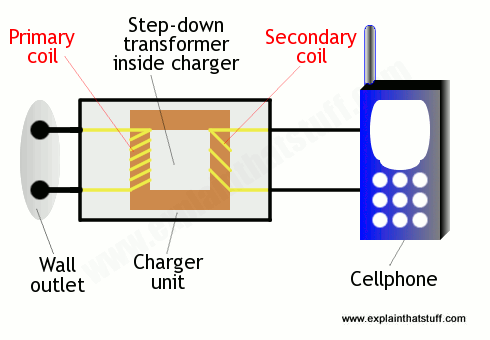 Powering Up a Phone, No Cords Needed by Eric A. Taub. The New York Times. August 6, 2014. Starbucks, Cadillac, and many others are embracing wireless charging. WiTricity's wireless charging technology is coming soon to mobile devices, electric cars, and more by Rob Matheson. Phys.Org, July 10, 2014. How WiTricity's system was developed with help from MIT's Marin Soljacic and how it differs from similar systems such as charger mats. Automatic Recharging, From a Distance by Anne Eisenberg. The New York Times. March 10, 2012. Explores WiTricity's induction system, which can charge devices at a distance. A Critical Look at Wireless Power by David Schneider. IEEE Spectrum, April 30, 2010. We're all used to wireless communication; how long before power goes wireless too? Wireless power system shown off by Jonathan Fildes. BBC News, July 23, 2009. A demonstration of Witricity's wireless electric charging system and how it can be used in everything from cellphones to electric cars. SmartKetai: Review: Powermat Wireless Charger for HTC EVO 4G: Unboxing & Overview: A simple description and demonstration of a Powermat add-on for an HTC cellphone (mobile phone). US Patent 8,629,577: Pinless power coupling by Yossi Azancot et al, Powermat Technologies, Ltd. January 14, 2014. This patent goes into great detail about how Powermat chargers work. US Patent 7,741,734: Wireless non-radiative energy transfer by John D. Joannopoulos, Aristeidis Karalis, Marin Soljacic, MIT. June 22, 2010. This describes the "resonant" charging technology behind WiTricity's at-a-distance chargers. 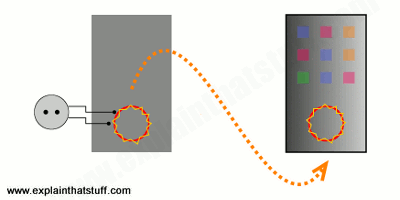 US Patent 8,629,578: Wireless energy transfer systems by Andre Kurs et al, WiTricity. January 14, 2014. This patent applies the WiTricity charging system to wireless computer peripherals such as keyboards and mice. US Patent 645,576: System of transmission of electrical energy by Nikola Tesla. March 20, 1900. One of Tesla's original patents for wireless power transmission: "Expressed briefly, my present invention... consists then in producing at one point an electrical pressure of such character and magnitude as to cause thereby a current to traverse elevated strata of the air between the point of generation and a distant point at which the energy is to be received and utilized." Wizard: Life and Times of Nikola Tesla by Marc J. Seifer. Citadel Press, 1998. A biography of one of the pioneers of our modern electrical age. Tesla devoted much of his time to putting induction to practical use. Tesla: Man out of Time by Margaret Cheney. Simon & Schuster, 2001. An alternative biography exploring how Tesla's strangely compulsive personality drove his farsighted contributions to fields such as robotics, electric power, missile science, and computing. Electricity and Magnetism by W.J. Duffin. McGraw Hill (Various editions and dates). A clear and concise undergraduate text (the one I used myself a few years ago). Powermat is a registered trademark of Powermat Ltd. WiTricity is a trademark of WiTricity Corporation.